Adopting a Senior Dog. . . Should You Choose a Big or Small Breed? Adopting a Senior Dog. . .
Should You Choose a Big or Small Breed? You are thinking about adopting a senior dog, but you are having trouble deciding what kind of dog will be the best fit for you. This article talks less about breed type and more about size. Should you get a big senior dog or a small senior dog? Consider the following four tips when deciding on what sized senior dog is right for you and your family. First you need to consider who will be the primary care taker of the dog. What I mean by this is, who will be spending the most time with the dog? Who will walk the dog, take the dog to the vet, feed the dog, etc.? This is important. If the primary care taker for the dog is grandma, then getting a 120-pound senior dog is probably a bad choice. Why? Well what if the dog collapses on a walk, or what if the dog has trouble getting into the car? Can grandmother pick the dog up and put him in the car? Can grandmother get the dog home after he falls and hurts his leg on a walk? When deciding if you want to get a large or small senior dog, the weight of the dog is the limiting factor. While most people will probably struggle trying to get a 120-pound dog home if he hurts his leg, some people can deal with that situation better than others. There is a reason why most senior citizens with dogs have small dogs. Small dogs are easily picked up and moved without great strain to their owners. If a small dog gets injured, they are not as dangerous and powerful as a 120-pound dog in the same situation. 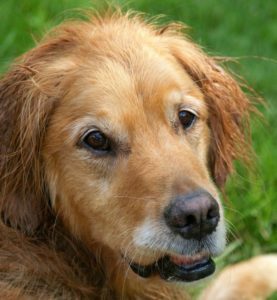 The first thing to consider when getting a senior dog, is what is the primary care taker can handle. If you decide that you want to adopt a large senior dog, you should be aware of some of the common issues that large senior dogs have. Large dogs tend to develop joint issues as they age. They might get hip dysplasia, elbow dysplasia, arthritis, or a combination of the three. Because large dogs are heavy, their joints tend to wear out faster than smaller dogs. This can be very painful for your senior dog and treating it can be costly to you. 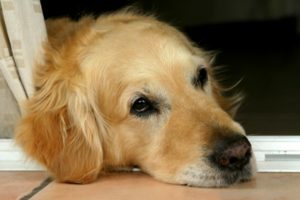 You need to consider if you are, one, able to help your senior dog in the case that he does develop any of these issues, meaning, can you help him walk, and pick him up if need be? Also, you need to consider if you have the resources to help him deal with these issues. He may need to go to the vet more often, and he may need a special bed. If you do have the ability and resources to adopt a large senior dog, you may want to consider getting him a memory foam dog bed. Memory foam is the only substance that can be considered truly orthopedic, which means that when your dog sleeps on a memory foam bed, he will develop no pressure points. This is important for large senior dogs because when they sleep, their weight tends to compress their arteries and veins as well as their joints. Joints that get less blood flow because their arteries that bring them oxygen are compressed are not as healthy as joints with full circulation. As a result, getting your large senior dog a memory foam dog bed can help his joints stay healthy because memory foam beds allow for full circulation. Memory foam dog beds are great for all dogs, old, young, large and small, but they are particularly good for dogs with joint and bone problems, like large senior dogs. Maybe you do not have the ability to adopt a large senior dog, or maybe you just do not want to. That is oaky, small senior dogs need homes too. A great thing about small senior dogs is they are easily manipulated. Let me re-phrase that. Small dogs are easily picked up if need be, as previously mentioned. Small dogs can also sit on your lap, which is great because animal and human contact is a very positive experience. Small dogs also easily fit into cars and carriers, making them much better travel companions than large dogs. One thing to remember about small dogs, especially senior small dogs, have a much more difficult time regulating their temperature than large dogs. Small dogs have a much greater surface area to mass ratio, meaning they have more skin than insides. This means that more of their body is exposed to the elements, like wind and cold air. This makes small dogs cool off faster than large dogs.